4 kids learn a girl their age doesn't have clean water & set out to help. Read how they make a difference and learn how you can too! 131 backers pledged $3,913 to help bring this project to life. Helping someone see and learn about a world outside of their own is a difficult task at any age, but especially for young children. Clean Water For Elirose provides a tangible, concrete way for parents and teachers to educate young children about the difficult circumstances some children face in other parts of the world. Click here or on the book below for a FULL Preview! The book has already been written and illustrated. All that's left is for it to be officially published! The $3500 raised here will be used for printing and making the book affordable for teachers and parents. The back of the book contains activities for classrooms and families and a list of organizations to donate to that build clean water wells. The ideas and activities are simple and easy for even the youngest child to participate in and tangibly make a difference in the lives of other children around the globe. This book is about inspiring young kids to be global citizens, not about profit margins. In that spirit, we're offering a copy of Clean Water for Elirose as a reward for any pledge of $3 or more. $3 is a few coins shy of the cost of printing and shipping the book to you, but collectively we'll surely cover our cost and we're more excited about your young ones getting their hands on a copy of the book! Give $3 or give a little more and get a copy today. 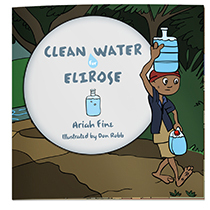 An awesome downloadable coloring book of Clean Water for Elirose is yours to use and share. "PAY WHAT YOU CAN" for 1 copy of Clean Water for Elirose. If you only have $3 to spare, we'd want you to get a book and inspire a child, not buy a latte. Choose this reward and receive one copy for every dollar you pledge! That's 25 copies for $25 or 50 for $50! Buy them for your group, class or entire school. ORGANIZATION SPONSORS - For non-profit organizations that build wells in the developing world. You'll receive 100 copies and have your organization listed on the Clean Water Organizations page in the back of the book.